I have to admit, it is often a struggle for me to reconcile my love of cooking and baking with my desire to eat healthy and feed my family well. As much as I love cooking pasta dishes with bechamel sauce, a weekly diet of heavy meals is not so great for my overall health. I'm trying to find that balance and often turn to smoothies, soups and salads for ways to even out my calorie intake and even sneak in those dark green veggies that are sometimes more difficult to incorporate on a daily basis. Smoothies are by far my favorite way to get my toddler to eat her veggies. She's at that lovely age where she'll love to eat something one day and hate it the next, so I give her a smoothie packed with fruit, yogurt, flax meal and generous handfuls of spinach every afternoon to fill in the gaps in her diet. She loves it and has no clue how healthy it is (Mom for the win!). One of my favorite smoothies for myself is one I created last week and just started adding greens into it. Baby spinach is my go-to, but you could easily substitute kale as well. Don't worry, you won't taste it! I also like to stay away from using juice in my smoothies, just because they usually have a lot of sugar and extra calories I don't need...I'd rather eat whole fruits and get the benefits that way! A great substitute for juice in smoothies are flavored unsweetened green teas. I adore good loose leaf tea, a friend of mine is a rep for the best I've had: Steeped Tea. You could easily use one of their fantastic flavored green teas, but I'm a little bit of a hoarder when it comes to my "good" tea, really wanting to enjoy it, so for smoothies I use a lower-quality bagged tea. Either way you're getting great antioxidants, a little flavor for the smoothie and zero extra calories. 1. Add in the tea first, then the frozen berries and ice, top with the oatmeal, banana and honey. 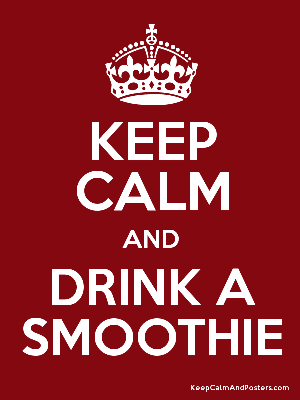 Adjust and add more liquid to get the consistency you want, make sure it is completely smooth and blended. 2. Add in the greens and blend until they are incorporated. This makes 2 servings so enjoy 1/2 the recipe and save the rest for tomorrow! I love adding a smoothie onto my light lunch of salad or soup. It just rounds out my meal and keeps me full and free of the desire to snack in the afternoon. What are your favorite ways to get veggies into your daily diet? I'd love some more ideas, so share away!